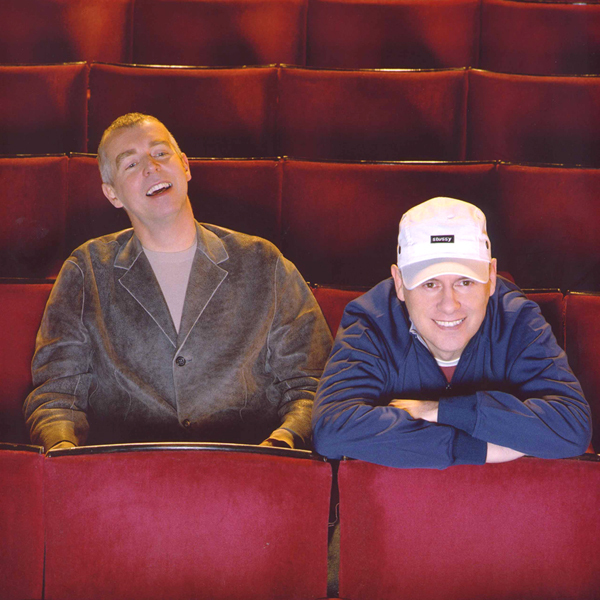 On May 31 the Pet Shop Boys' first musical, Closer to Heaven, opens at the Arts Theatre in London. (Preview performances have been running since May 15.) They had first mentioned their ambition to write stage musicals in a Smash Hits interview in 1986, and had been considering it seriously for the past decade. "We wanted to write something that wasn't Les Mis or Rent," says Chris. "A play about contemporary life with contemporary music that was not long and boring." In 1996 they had started writing what became Closer to Heaven with Jonathan Harvey, learning as they went. "The closer we got to finishing," says Chris, "the more we realised how important it is that there are no extraneous, meaningless bits. Even though it's a song, the lyrics are also dialogue." Closer to Heaven is set in a nightclub – "we know about nightclubs," says Neil – and revolves around the stories of a young Irishman, Straight Dave, apparently cocky but struggling with his sexuality and his dreams of being a pop star, and of a nightclub hostess Billie Trix whose years of great beauty and success have long passed. "We haven't set out to do a big West End musical," says Neil. "It's an attempt to do something new." There is some early validation from Elton John who, after the opening night, tells the Evening Standard that "the comfortable world of the West End musical has been blown apart." On June 6 the Pet Shop Boys release deluxe new versions of their first six albums: Please, Actually, Introspective, Behaviour, Very and Bilingual. All the music on them has been remastered (a fairly long process in itself, overseen largely by Neil) and each is reissued with an extra Further Listening CD of all the relevant other music recorded by the Pet Shop Boys in the same period, including a number of previously-unreleased recordings. Each now comes in a cardboard slipcase with a new 36 page booklet in which the Pet Shop Boys discuss in detail every single song. On October 6, the Closer to Heaven cast album is released, containing fifteen songs written by the Pet Shop Boys and, aside from two instrumentals, sung by the original Closer to Heaven cast. (Only three of the songs have previously been recorded by the Pet Shop Boys, all in very different versions.) The album is produced by Stephen Hague and the Pet Shop Boys. It does not include, however, the rarest of all Pet Shop Boys and Closer to Heaven-associated releases, a CD single only available in the theatre foyer by the character Billie Trix (played by Frances Barber), combining her original 1971 hit "Run Girl Run" with her 1981 re-recording of the same song. On October 13, after playing for nearly five months to considerable acclaim, the curtain closes for the last time on Closer to Heaven's London run. On November 12 Montage, a DVD based around the Nightlife tour, is released. Instead of a straightforward document of the tour, the DVD intertwines and interweaves footage shot in Dortmund, New York and Atlanta and web cast footage with background footage from both the Nightlife and summer 2000 tours. During some recording with New York dance music producer Peter Rauhofer in May 2000, he persuaded Neil, who was initially reluctant, to record a vocal over a new version of Raze's house anthem "Break 4 Love". "One of your best vocal performances for a long time," comments Chris. In December 2001 the result is released in America under the name: Peter Rauhofer + Pet Shop Boys = The Collaboration.